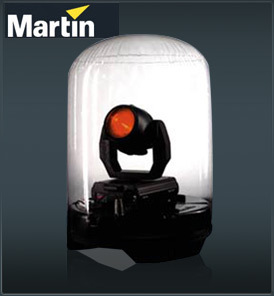 The Martin King Dome is a convenient, inflatable version of Martin’s Outdoor Protection Dome, allowing Martin luminaires to be used outdoors, all year long and in any type of weather. Made of durable, non-flammable PVC film with a solid base of ABS plastic, the King Dome is ideal for rental companies and events where easy transport and simple set-up are essential. The King Dome reduces to a minimum for easy storage. IP 44 rated, the King Dome allows all the color, effects and movement possibilities of Martin luminaires to be utilized in any environment. The King Dome is equipped with a unique safety device that cuts the power to the fixture in case of deflation. It is available in two different heights and a 3 meter semi-transparent white envelope is available for use as a lightpipe effect.